The possibility to aggregate UI from several devices. 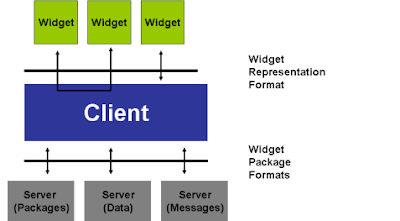 The scope of the MPEG UI framework can be clustered into a widget representation and widget package formats as depicted in the figure above. Thus, the requirements (N10231) can are organized in a similar way. Evaluation of answers: 2009/04/18 – 2009/04/24 (during the 88th MPEG meeting (http://www.chiariglione.org/mpeg/meetings.htm) and the week end before: proponents are strongly advised to present their proposals in person). Interested parties are kindly asked to respond. The submissions both by MPEG and non MPEG members shall be received by the 15th of April, 2009 23.59 hours GMT, by Joern Osterman, chair of the MPEG Requirements Group, (ostermann_AT_tnt_DOT_uni-hannover_DOT_de). Further details about the submission procedure can be found in N10232. I'll post the links to the requirements document and CfP as soon as it becomes available on the MPEG Web site.